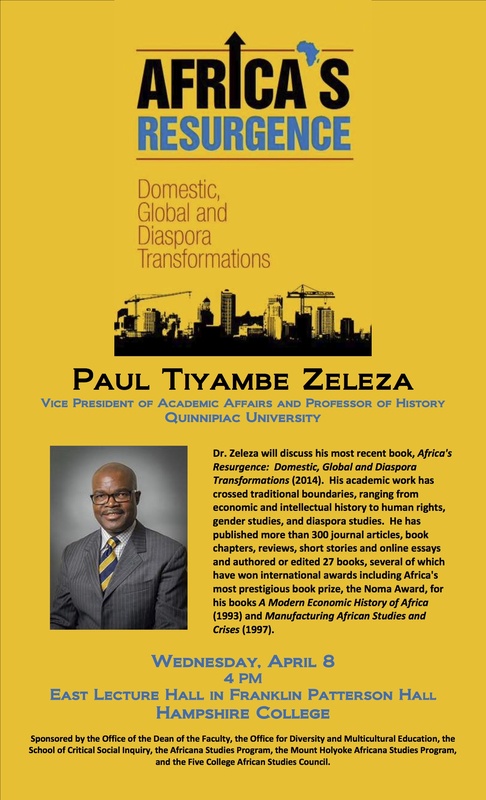 On Wednesday, renowned economic historian Paul Tiyambe Zeleza came to give a talk at Hampshire College. His talk drew on his latest book, Africa’s Resurgence: Domestic, Global and Diaspora Transformations. The event was well attended and provoked a lot of interesting questions. The part that stuck with me most was Zeleza’s discussion of the growing importance of the diaspora in Africa’s future. Going beyond the power of remittances in shaping individuals’ lives, Zeleza talked about the many different ways the diaspora contribute to development back home — and how they have been for generations. He talked in particular about an initiative he’s started, The Carnegie African Diaspora Fellowship Program, which generously supports African-born academics in the U.S. and Canada in pursuing partnerships and research opportunities with academic institutions in Ghana, Kenya, Nigeria, South Africa, Tanzania and Uganda. Paul is himself part of the diaspora — a Malawian born in Zimbabwe, educated in Canada, and working in the U.S.
I’m lucky to have and come across a number of students who remind me of what a young Paul Zeleza might be like today. A few of them are engaging in just the kind of diaspora-driven development projects Paul talked about on Wednesday. A couple are raising funds for these projects. I don’t normally use this blog as a forum to solicit charity donations, but these are great projects led by thoughtful people who are trying to give back to the places they’re from. Jemimah Kamau, a junior at Mount Holyoke College, is raising funds for Peace Through Literacy: Ting’ang’a Library Project, a library to be shared by four elementary schools in Kiambu, Kenya. Another Mount Holyoke student, Ellen Chilemba, has started a grassroots NGO supporting women in her home country, Malawi, and you can support her organization, Tiwale, by purchasing beautiful hand-dyed fabrics. Oumar Ba, a PhD student at the University of Florida, is raising funds for a computer lab for Galoya High School, in his hometown in northern Senegal. If haba na haba readers know of other worthy diaspora-driven development programs worth supporting, please share them (with links) in the comments! Yes! AiD is like the meta- initiative of this!